It seems like every time you read an article about kid’s teeth and food, it’s about all the foods kids CAN’T eat, like candy, sticky foods, hard food, etc. However, there are lots of great snack options for kids that are good for their teeth, and they can be delicious too! Below are a few of the best snacks for kid’s teeth that can be great replacements for sweet treats, and a little more information on why sweet snacks can be OK, in moderation. Why exactly are sugary treats so bad for kids? Too much sugar has been shown to contribute to a host of health problems, tooth decay being one of those issues. Of course, kids want sweet treats occasionally and in moderation, a small sweet snack can be OK for kids. Here’s the issue: When you put sugar in your mouth, the bacteria in the plaque gobble up the sweet stuff and turn it into acids. These acids are powerful enough to dissolve the hard enamel that covers your teeth. That’s how cavities get started. So if you’re going to let your kids eat a sweet snack, be sure to have them brush right afterwards with a fluoride toothpaste to avoid these acids sitting in their mouth for too long. What are good alternates to sweets that my child will eat? While a few of the above fruits do have a dried fruit option, the best snack for kid’s teeth are fresh fruit, and it’s nutritious too! The dried fruit tends to get stuck in the nooks and crannies of the teeth and sit there for the bacteria to feed on, which then leads to cavities. So stick with fresh fruit! You can always enhance any of these veggies with a little dressing dip or peanut butter. The idea is to get them to love the snacks they’re having while keeping their smiles healthy. You can also opt for healthy breads or cheese but remember, try avoiding adding sugar by giving them a sugary spread or dip to go with it. Believe it or not, even goldfish crackers are a culprit of cavities because they get lodged into the grooves and as a simple carbohydrate, they turn into sugar. As mentioned before, sugar in moderation is fine. If your child must have a sugary snack, be sure to avoid the kind that stay in the mouth for a long time, such as hard candies, suckers, jaw breakers, or anything else that takes a while to consume. The damage is done when the sugar lingers in your child’s mouth, so opt for a sweet that is easily and quickly consumed, and keep it as low in sugar as possible. For example, a Hershey’s kiss is always a good option. One of the worst “snacks” that have become a part of everyday habits hurting your child’s teeth include sugary soft drinks and fruit juices. Keep them to a minimum to insure your child’s teeth are safe. Soda is a definite “no no” because the acid from the soda erodes away your children’s teeth. Fruit juice is fine, but only if you dilute it with 75% water and only add 25% fruit juice. Looking for more guidance on what snacks are best for your child? Ask your pediatric dentist to provide a complete list of snack options and foods to avoid. 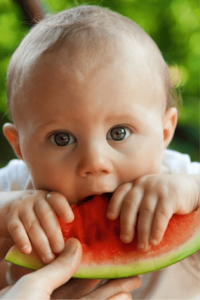 They’re pros at suggesting great snacking tips for healthy teeth as well as other healthy oral habits for your child.